Plus Size Kitten: Party Moo Moo sounds dam cute! I am a person addicted to party decorations. I love balloons, decos, gift boxes, packaging.. u name it anything that makes a party turn magical, I like! Recently I found out that there's this balloon shop nearby my condo (Mont Kiara). The name of the shop is dam cute I tell you! It's call Party Moo Moo, makes you wanna mooooo out when you say the name. About 2 weeks ago, my company celebrated their 1st Anniversary and I thought it would be dam cool if I go buy balloons to add some happiness on that happy day (haha). I pop over to Party Moo Moo, Solaris Dutamas and the owners were there (almost all the time when I go! I feel like they're going to put a No Tammy sign outside their shop soon). They were sooo nice! 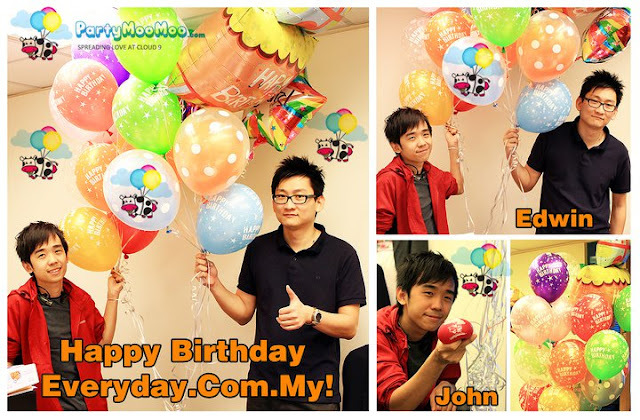 helped me plan a quick idea on what to get with my budget and also deliver my balloons to Mid Valley (my office). Hhahah what so he's your type ka? !